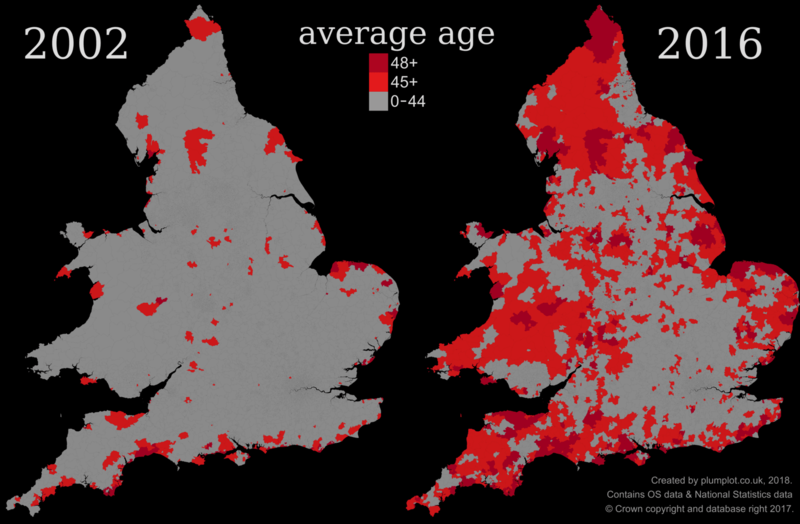 In 2002, the average age in England and Wales was 38.8. In 2016, it was 39.9. The change can be seen on the maps below. There are 7,201 areas on each map. These areas are called MSOA, or Middle Layer Super Output Area. They were designed to improve the reporting of small area statistics and they were used in Census reports. In 2002, 40% of the population was over 44 years old. Fourteen years later it was 43.5%. The share almost equaled to the population below 35, which was 43.7%. Life expectancy also increased. For people aged 65 years or older, the expectancy increased by more than two years. Their share increased by 2.1% between 2002 and 2016. There were 7.1k centenarians in 2002 and 13.7k in 2016. When we highlight areas with the average age below 35, there is no significant change between 2002 and 2016. Most areas were located mostly in cities - London, Birmingham, Manchester, Leeds, Bradford, Bristol, Leicester, Sheffield, Nottingham, Cardiff and some others. 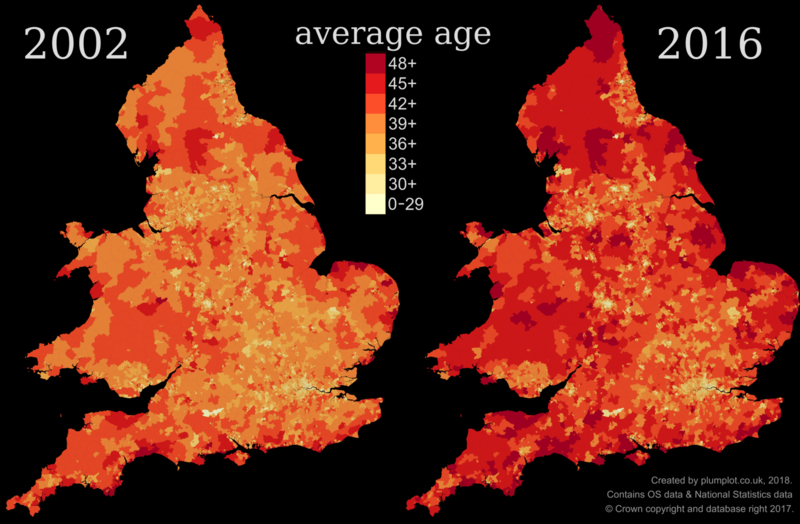 The number of areas with the average age 45 and over has multiplied since 2002. It went from less than 300 in 2002 to 1,100 in 2016. The highest increase of areas was in Wales, North of England and South West England. In 2016, most areas were in Cornwall, East Yorkshire, Cheshire East, Wiltshire, Shropshire, Northumberland ( Sefton, East Devon, Powys, Durham ). 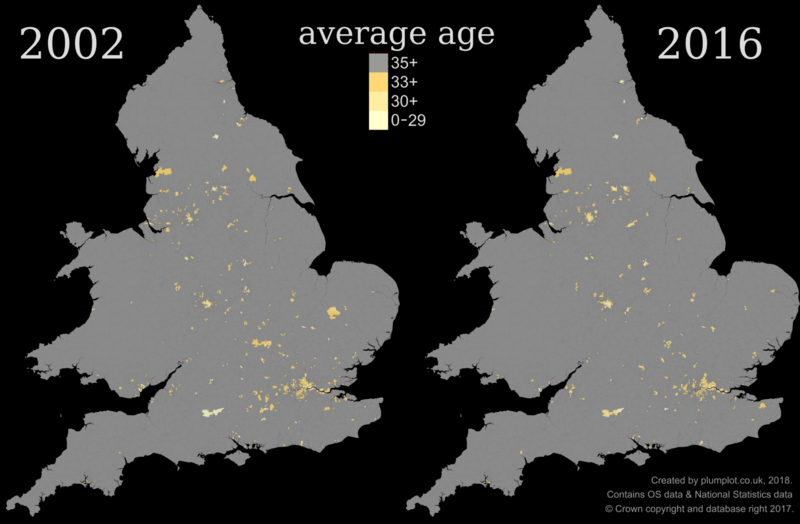 Interestingly, areas with the high average age are quite often coastal areas. Improved healthcare and lifestyles is the main reason for the increase in life expectancy. The growth in population is not only due to migration and natural changes (births has been outnumbering deaths in the UK since 1955, except 1976) but also partly because the population is ageing. According to the UK Office for National Statistics, the percentage of the UK population that is 65 years or older is projected to continue to grow to nearly a quarter of the population by 2045. One-third of babies born in 2013 in the UK are expected to live to 100.